Outside Christmas decorations make the holiday season bright! 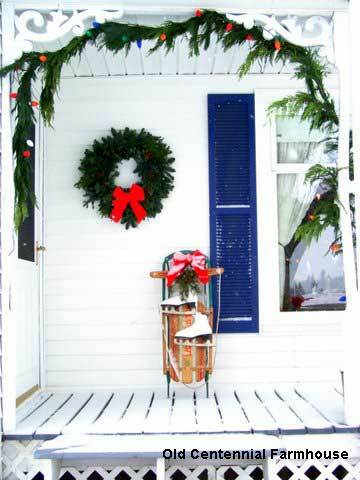 Each year in mid-November (sometimes earlier) many of us begin thinking about outdoor Christmas decorations: how to decorate for the season, what outdoor Christmas ideas can I use, or how do I make my front porch really attractive for the season. We can help you create your own magical wonderland. Use our holiday pictures along with tips and ideas to begin planning and decorating for the season. 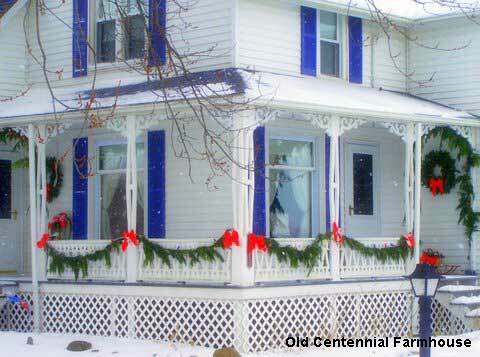 We also feature Joni's country home and front porch Christmas outdoor decorations. 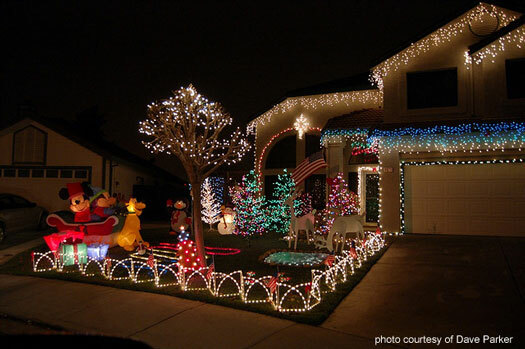 From the very simple to the most sophisticated and elegant, outdoor lighting is perhaps the most common and often the least expensive options for holiday decorating. You can outline the architectural lines of your home and front porch or create amazing front yard displays (or do both) as depicted in the photos above and below. 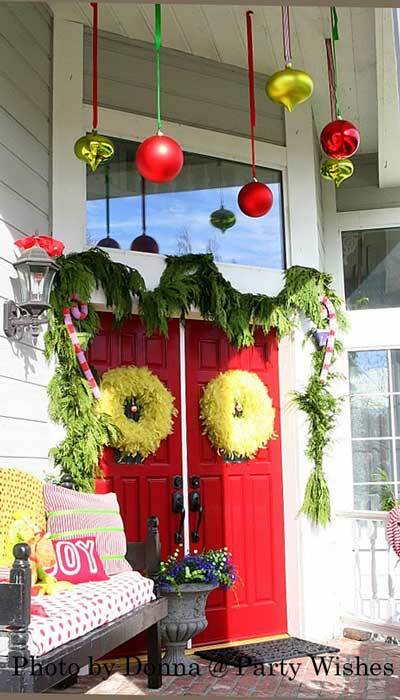 Donna's Grinch Christmas decorative front door and porch below is a perfect example of what you can do. What a fun way to celebrate the season. 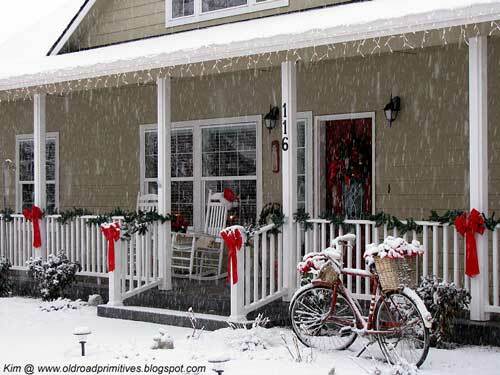 Kim's outside Christmas decorations below include using an old bicycle, Christmas greenery, and red bows. We will be the first to say that we love that bicycle. Simple in design yet it creates a beautiful holiday scene. 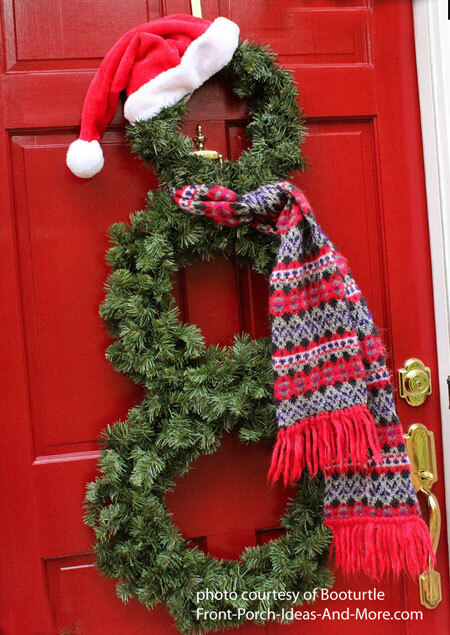 Whether you purchase one to suit your needs or make one yourself like the one below, Christmas wreaths are always a welcoming sight. 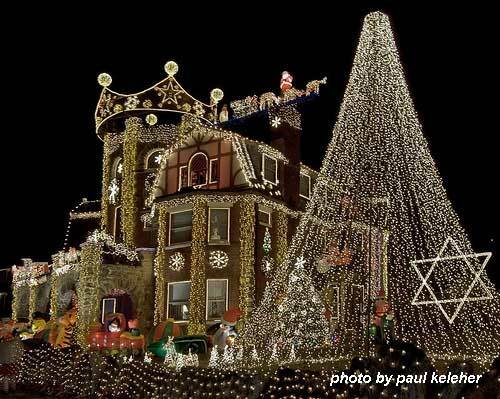 Be sure to see our Christmas lighting ideas and our entire Christmas decorating section for additional ideas, projects, and decorating tips. 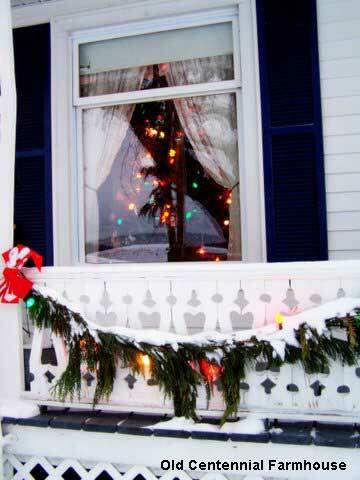 Her outdoor Christmas decorating ideas are traditional, charming and easy-to-do! 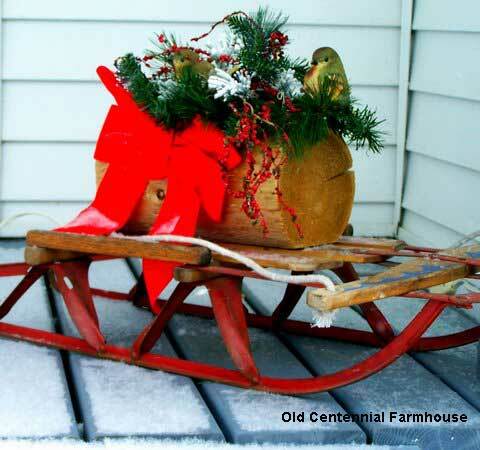 Joni decorates her porch with evergreen roping, evergreen wreaths, traditional red velvet bows, old-fashioned Christmas lights, vintage sleds and vintage skates. She picks them up at garage sales during the hot summer months - when Christmas is far from most people's thoughts. She tucks them away in the barn until the air turns cold and snowflakes start to fly. 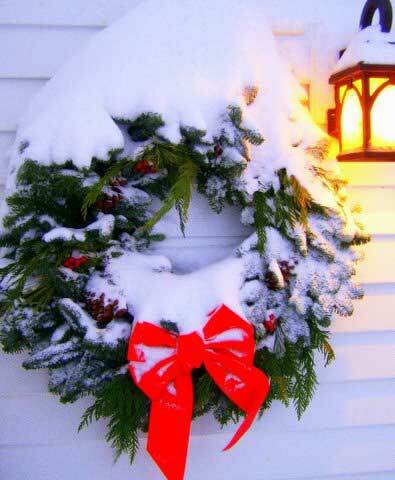 Joni says: "After Christmas when the lights and the roping come down, around mid-January, I leave the wreaths with the red bows on until after Valentines' Day. It just seems to make the porch seem so empty, bare and naked when ALL of the Christmas cheer is removed at once! So it's a gradual removal for me!" Joni goes on to say: "Snow is the perfect accent to all the decorating for Christmas as you can tell in these photos. It's pretty on its own, but BEAUTIFUL with the help of Mother Nature who sprinkles in a most artful way with glitter and fluff!" Joni: "For Christmas, I splurge and buy the real greenery and wreaths; but for years I used the reusable evergreen roping and wreaths. The big red bows set either the artificial or the real thing off so well. "The sleds and skates were gathered for a song. I didn't pay more than $10 for any of the sleds! And in the hot summer, there's not a lot of people grabbing for sleds so they're easy to get. "Always look in the boxes under the tables for skates: most pairs thrown here over the sleds as decorations were $1 a pair! 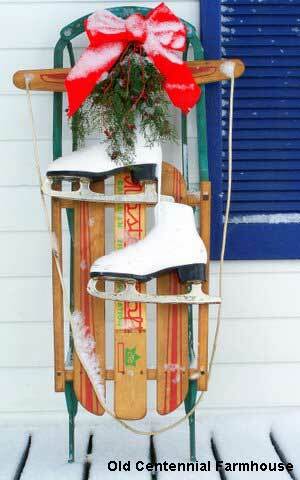 They make the vintage sleds look so sweet! "Hung on a nail for the rest of the year, the sleds and skates are out of the way and ready to go again in the late fall." Do you see the little bird? We are very pleased that Joni let us stop by her country farmhouse today. 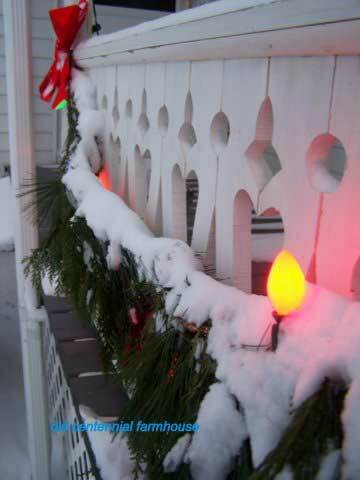 Her outdoor Christmas decorations bring back memories of days-gone-by. 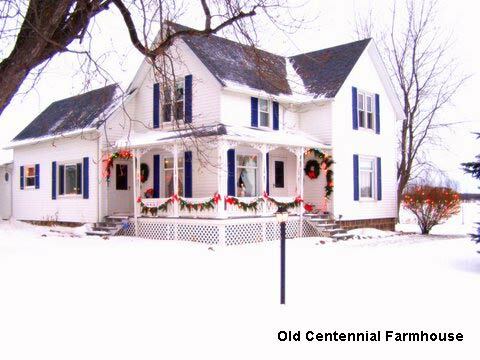 Please stop by Joni's blog, Old Centennial Farmhouse, and learn more about living in the country. You can read more about her wonderful old porch here.